For correct transformation of DITA files (XML-standard for modular documentation), it is necessary to pull information from DTD (document type definition). In my python code, sometimes I did get this information and sometimes not. Now I’ve tracked the source of instability and corrected the code. The PDF is of some non-standard landscape layout, the printer is an usual A4 printer, the software can’t handle the mix correctly. The solution is to tune the dimensions of the PDF pages manually. For XML to DocBook to .docx conversion, I found that “le-tex transpect” framework has solved many technical issues already, so I overcame the “not invented here syndrome” and decided to rely on this tool. To tune the stylesheets for own needs, I created a github copy of the repository: docxtools. To run the stylesheets outside the framework, a special setup is required. The setup is described in the folder “doc/hello-world“. GNU FriBidi is an implementation of the Unicode Bidirectional Algorithm (bidi). There is a Python binding PyFribidi, but it is not complete. What I need is not a visual presentation of a string, but information where direction is changing. This function is not provided by the binding, therefore I’ve made an alternative using ctypes. Theoretically, a part of a PDF file is allowed to be stored externally. The “external streams” were introduced already in an ancient PDF specification. But only Acrobat (Reader) 5 supports it. For Acrobat 8, one has to find a hidden security option to activate support. Apple Quartz seems not to support external streams at all. The same for poppler (definitely, the source code is checked) and maybe its ancestor xpdf. I’ve noticed that headers and footers of the documents, generated by XeLaTeX, use some other font instead of Helvetica. After digging into the LaTeX code, the problem is solved. I wanted to convert text to curves in PostScript. The well-known tool to do it is pstoedit (alternatives are welcome). Unfortunately, it worked only partially. There is a number of XML-editors, but there are no user-friendly ones (except FraemMaker). A standard XML editor is a tool for programmers, to play with XML. But technical writers need an user-centric XML editor, to play with a document, not with XML. I’m not the only one who works on a publishing server. Steve Whitlatch announced recently Mr. XML Publisher for DocBook, a free online publishing server. You feed a DocBook to the service, and the service returns back the corresponding PDF. When I print books, I prefer to have two pages per sheet. With PostScript or PDF books it’s easy, I just use psnup2.pl. But for djvu format, the procedure is complicated. A paper about TeXML and Consodoc is published in TUGboat 28:1, 2007: TeXML: Resurrecting TeX in the XML world. 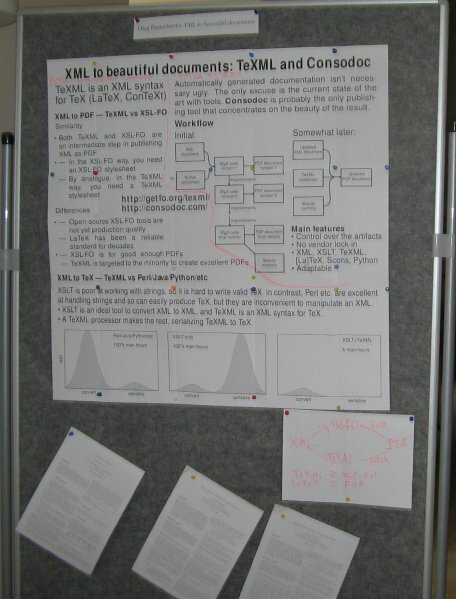 Also, the tools were presented as a poster at XML Prague 2007 conference: “XML to beautiful documents: TeXML and Consodoc“. Abstract: I’d like to present an alternative to XSL-FO. Using TeX to create PDF from XML is an old trick, but thanks to TeXML (an XML syntax for TeX) and Consodoc (a publishing server), the process is greately simplified and the produced documents are of high quality. * http://getfo.org/texml/ — URL linking to a web page related to the poster. * zooms the pages as much as possible.